I was in our local coop the other day and was happy to see Chef Kate of Community Cooking with Kate doing a food demo. The things she demos are always delicious and use seasonal ingredients, plus she gives out recipes! 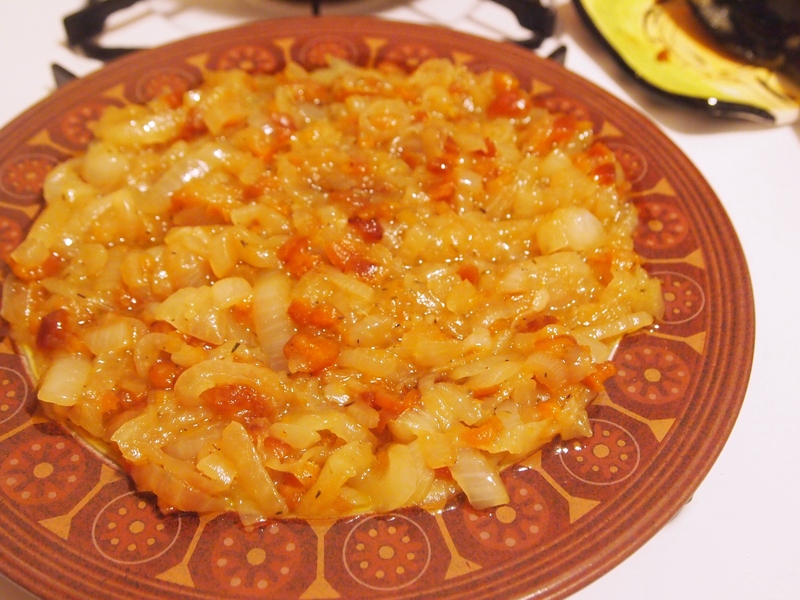 I especially liked this onion jam, something I don’t think I’ve ever tasted before. Yum! I made this yesterday for a potluck dinner + movie with friends for our appetizer. 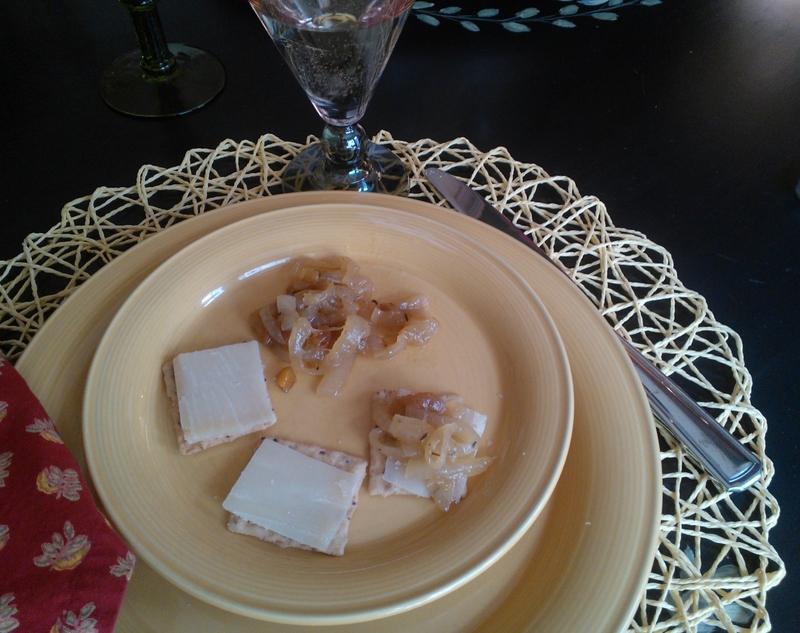 Chef Kate served the jam with gruyere cheese and artisan nut thins crackers, so I followed suit. I have to confess I was a little worried whether we would like this. Not to worry, every last morsel of crackers, jam and cheese were gobbled up with a side of rave reviews! So next time you want to serve a unique appetizer, I highly recommend this. A glass of Prosecco is a great match. NOTE: you can adjust ingredients up or down to taste. You can also substitute golden raisins for the apricots. Heat the olive oil in a heavy bottom pan over medium heat till shimmering. 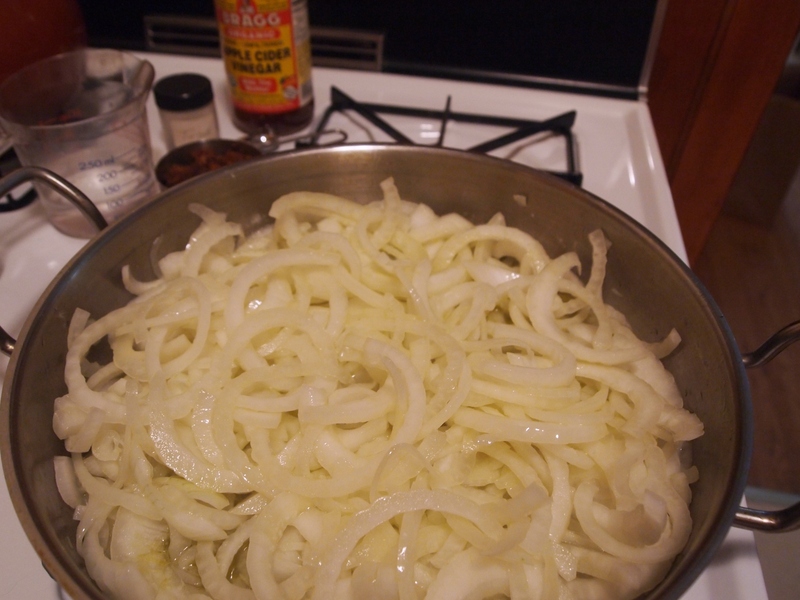 Add the onions and the salt and saute for about 15 minutes, until translucent and fragrant. 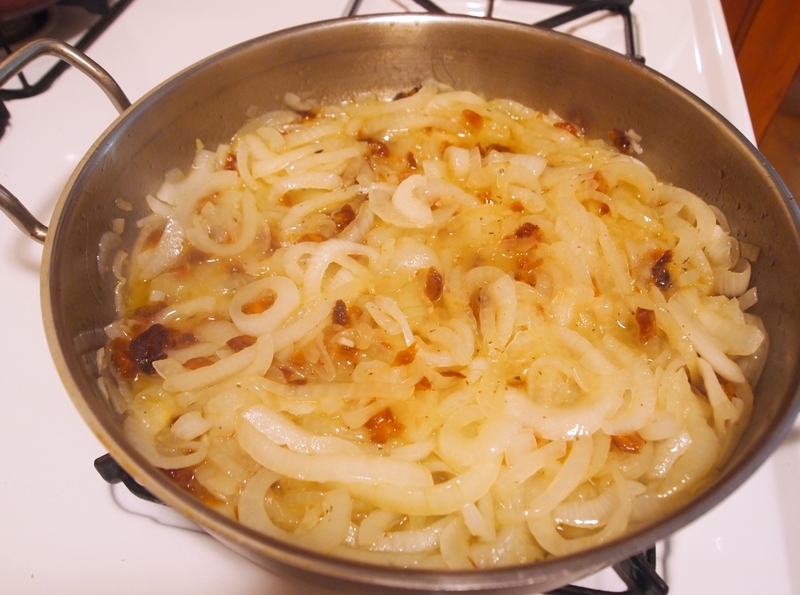 Reduce heat to medium low and simmer uncovered for 30-45 minutes until caramelized. Check every so often to stir and add water if it’s becoming too dry in order to prevent scorching. I used the entire 45 minutes. Serve with cheese and crackers or crostini. I think a manchego or a pecorino romano would work well as options to the gruyere. Randy thought this was equally delicious without the cheese.